Lexus’ answer to the BMW 5 Series, Mercedes-Benz E-Class and Audi A6 dares to be different in a class that’s defined by its relative conservatism. Lexus’ answer to the BMW 5 Series, Mercedes-Benz E-Class and Audi A6 dares to be different in a class that’s defined by its relative conservatism. So there’s no estate offering and no diesel engine, the latter in particular underlining why there aren’t too many used examples out there to choose from. The GS is available as a saloon only, and petrol or petrol/electric hybrid driven. As with all Lexus models the emphasis is on quality and refinement, though the GS is billed as a sportier model in the line-up. A lot of standard equipment and assured reliability are a draw, but the leftfield Lexus is an unusual choice in this class - but to many that is in its favour. Take your pick from either a 3.0-litre V6 petrol model badged simply GS 300 or the GS 450h, which combines a 3.5-litre V6 engine with an electric motor. It is badged '450h' as the performance on offer is supposedly equivalent to a 4.5-litre V8 - the hybrid system here as much about performance as it is economy. Take the green-tinted spectacles off and the GS 300 is actually the wiser buy, as the economy advantages for that hybrid version are marginal and you also lose a sizeable amount of the boot space to accommodate the battery pack. All versions are automatic and rear-wheel drive, and while Lexus bills the GS as a sporting saloon the reality is that it’s nowhere near as engaging to drive as a BMW 5 Series - or even the Mercedes-Benz E-Class. The GS does excel at Lexus’ traditional strength of refinement though, it being a quiet and comfortable place to while away kilometres. Even more so in the 450h, which can run briefly on electricity alone at town speeds, and does offer shocking pace (100km/h arriving in 5.9 seconds) when the mood takes you. Just don’t expect to get reasonable economy from it if you drive it briskly. There’s plenty to keep you amused inside too, Lexus throwing a sizeable standard kit list at the GS; whether you’ve gone for Executive or Sport models it’s unlikely you’ll find it lacking anything you need. 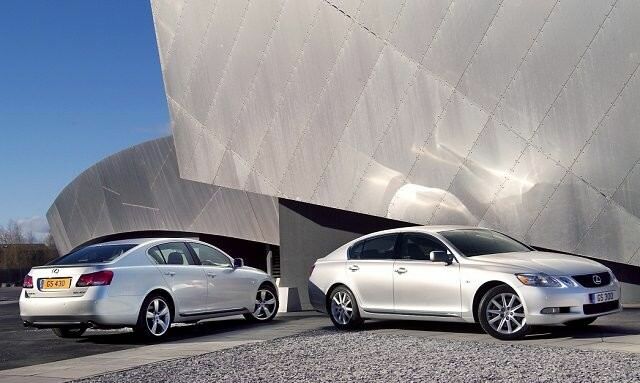 Reliability should be tremendous, Lexus an absolute stalwart in owner satisfaction and ownership surveys. In 2007 the range was given a mild refresh, post-facelift cars obvious thanks to shapelier door mirrors containing indicators, a larger front grille and revised lights. That GS 450h is little more than an anomalous talking point; if you’re in the market for a GS then the GS 300 is the car that makes the most sense, even if, with an official combined cycle consumption figure of 9.5 litres/100km, it’s not as impressive at the pumps as the 7.6 litres/100km GS 450h - though of course it’s unlikely you’ll get close to that. The standard car offers less potential maintenance issues as it ages, too. The GS has always been, and remains, a leftfield choice in the mid-sized executive marketplace. It’s neither as sporting to drive as its Germanic rivals, nor does it offer a diesel or estate car options. That said, there’s impressive comfort and refinement, and if you want something different the GS fits the bill rather nicely.